Large LCD atomic radio-controlled clock with alarm automatically adjusts for daylight saving time. 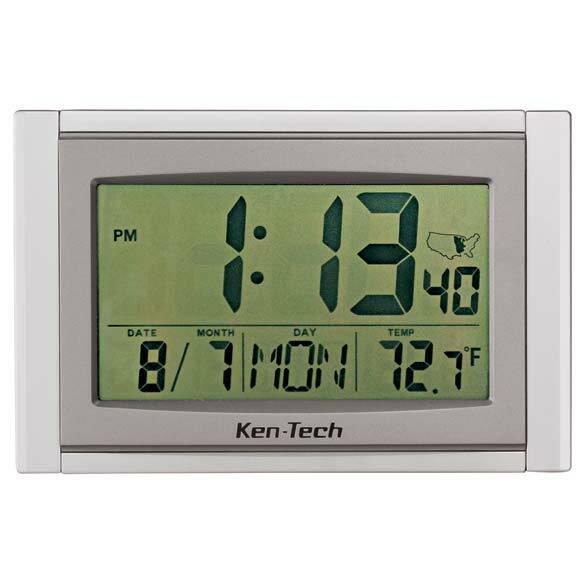 Features easy-read 2" time LCD digital display, along with date, day, temperature and time zone. Mount on wall or use pull-out stand. Digital atomic clock requires 2 AA batteries (not included). 9 1/2" L x 6 1/4" W x 1 1/4" D.
This clock only allows for continental US time zones. Clock time is always accurate. I don't have to fix the time for Daylight savings. i had a family member ordered one and i saw it and liked it. It's something I've been looking for. has large numbers, time and day and month. My mother loses what day it is and this is to remind her of the day. I need a new alarm clock and I find atomic clocks to be much easier for me to use as a senior with disabilities. The price and the reviews were right! Big display and hangs from wall. my husband and I ,since I no longer work, we get confused on which day it is. I choose this because of the special details on this product. Clock is automatic timing and so avoids having to correct the time. I also signed up for email hoping to get 20% off; however, reading closer means that it only applies to next order. Had I realized this, I would have not signed up for email offers. does this have lit numbers? BEST ANSWER: Thank you for your question. The numbers do not light up. We hope this information will be of help to you. The numbers are not lit at night. BEST ANSWER: Dottie, I am having the same problem. The only zone it keeps putting up is Pacific. I am in the Eastern zone. Why doesn't the outdoor temperature showup? BEST ANSWER: I did not have a problem with the temperature. Try to use set up or try to just move the battery within the clock. I had a problem getting to the correct time zone, but it is fine now. Good luck.